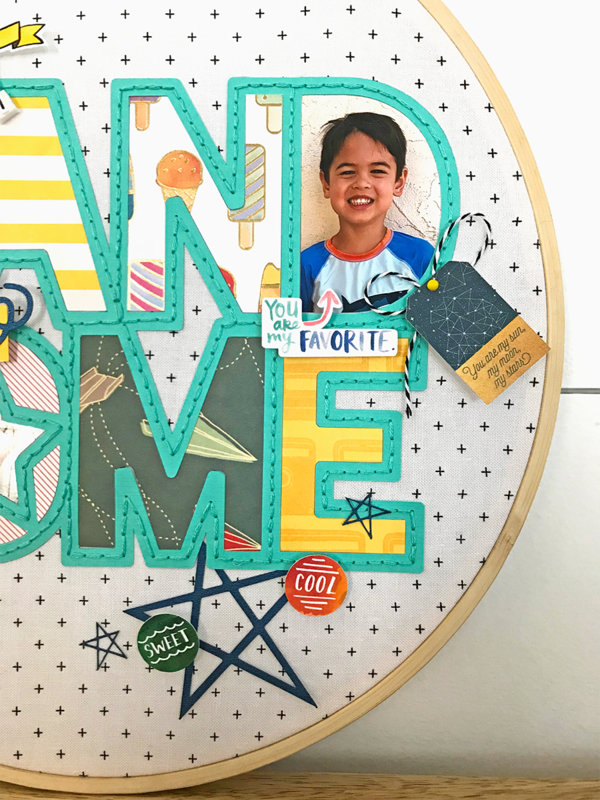 Typically, scrapbooking is done on paper and stored inside an album, but the fun part of creativity is that there are no rules and it’s okay to do things a little differently. 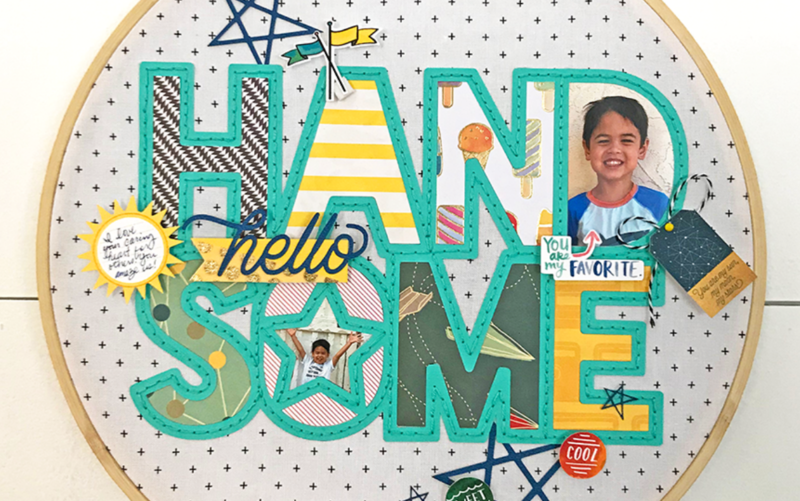 For this project, I wanted to showcase a scrapbook design in a way that is displayed on a wall as if it was art because, let’s be real, scrapbooking is really an amazing artform! So, here is a project that not only combines scrapbooking with embroidery but also features a mash-up of various Silhouette Design Store designs. Cut a 15-in circle from your fabric. Tip: Iron out any wrinkles from the fabric before proceeding. Center the fabric circle over the inner hoop and place outer hoop over the fabric so that the fabric is sandwiched between the two hoops. As you tighten the embroidery hoop screw, pull fabric taut as necessary so that the main working space (inside the embroidery hoop) is flat and smooth. Set up a 12 x 12 in. 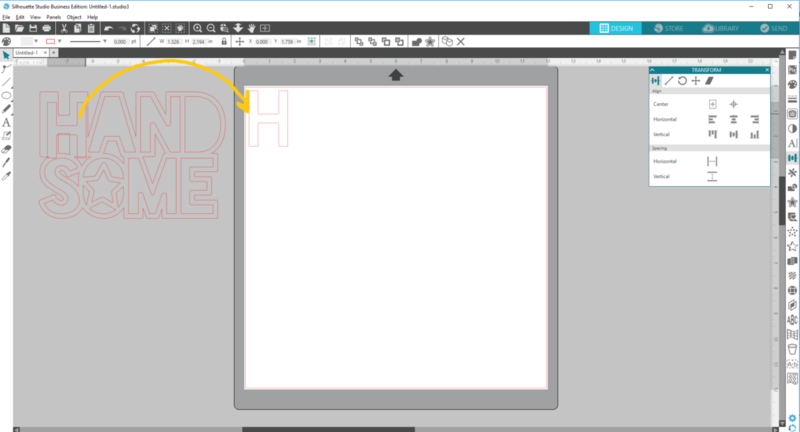 page in Silhouette Studio® and open Design ID #273597. Before resizing the design, lock the aspect ratio. Resize the design with a 5-in height. 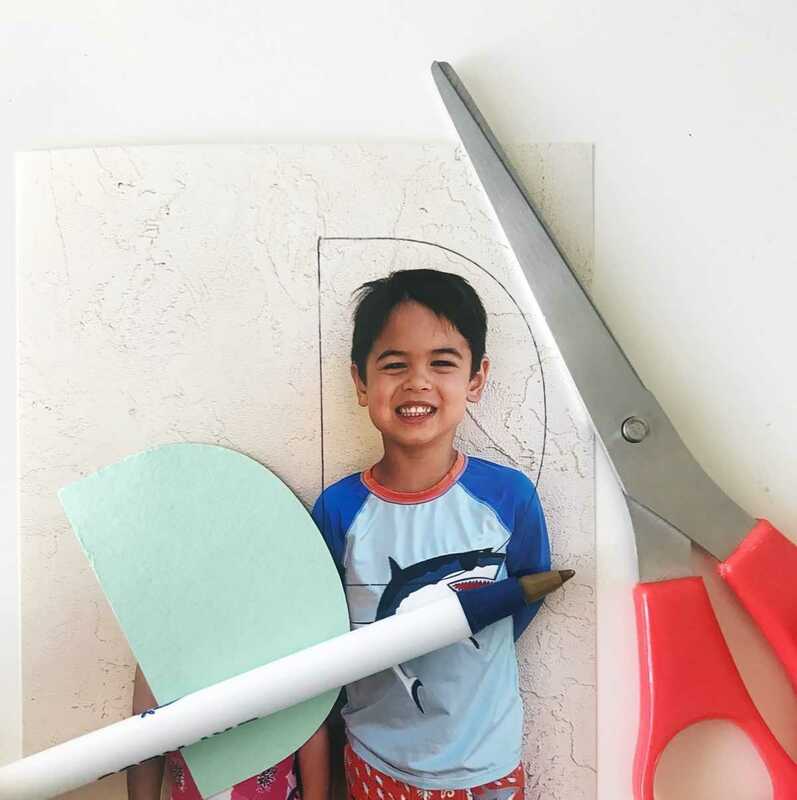 Set your colored cardstock on your cutting mat and send to your Silhouette with the proper cut settings. This is the outlined base piece. Now, we will cut out the internal pieces on various patterned scrapbook paper. 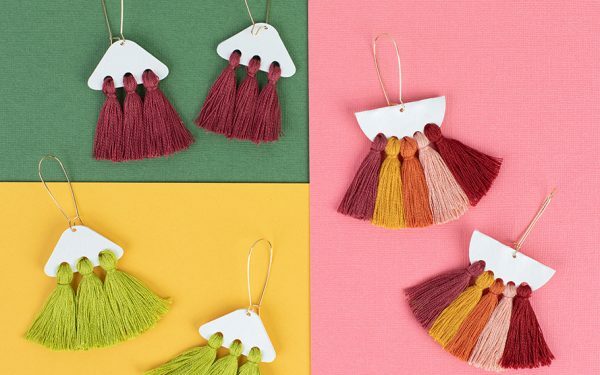 This is such a great way to use up paper scraps! Right-click and choose Release Compound Path. Move the entire design off the page. Starting with H, select the internal piece and send to the Silhouette. Cut it out of the patterned scrapbook paper of your choice. Continue the previous step on letters A, N, S, O (the tiny pieces outside of the star), M, and E.
For letters D and O (inside the star), use scrap pieces of cardstock because we will use these pieces as a traceable stencil. Place cutout D and O over your photos and use a ballpoint pen to lightly trace around cutouts D and O. Use scissors to cut along the marked lines. 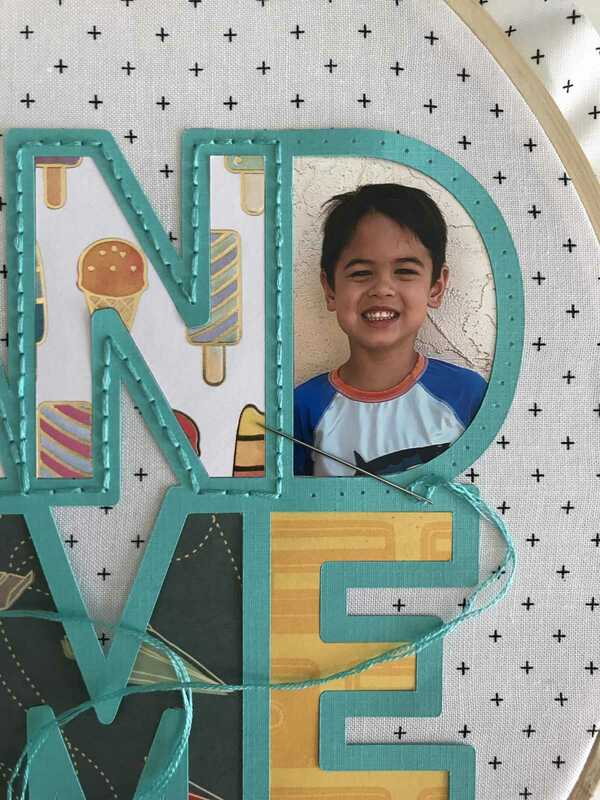 Set your outlined base piece centered on the fabric hoop. Insert the internal pieces to make sure they fit nicely within the outlined base piece. Use scrapbooking glue to secure the outlined base and internal pieces to the fabric. Tip: After you apply the glue, I suggest turning the hoop over (face down) and pressing down on the fabric to ensure the base pieces are glued to fabric. Lastly, backstitch along the outlined base piece using a sewing needle and DMC embroidery floss. Tip: I recommend separating the floss and using two strands at a time. I also highly recommend prepunching holes with your sewing needle before backstitching. Open the Print & Cut designs (Design IDs #221421, #206573, #125312, #86234, and #63695) on a blank 8.5 x 11 in. page size. Resize as you see fit for your project. Before printing, ensure that registration marks are turned on and visible. Make sure your Print & Cut designs are not inside the cross-hatched registration lines. Send to your color inkjet printer. Then load the printed sheet onto your cutting mat and send to Silhouette with proper cut settings. Set aside these Print & Cut pieces until step 9. Next, cut out Design IDs #247600 and #17222 using the colored cardstock of your choice. 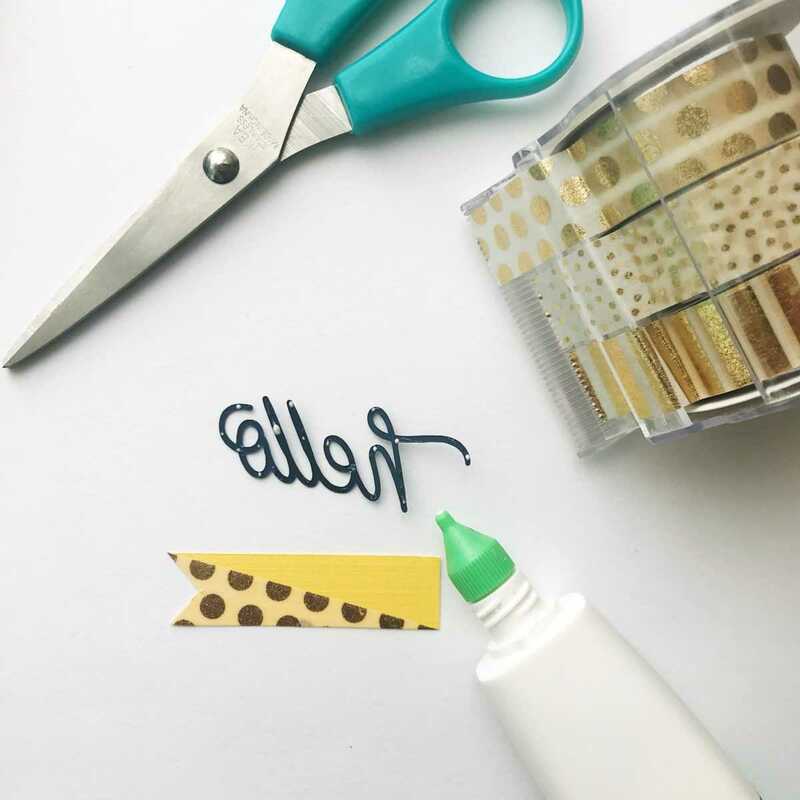 Use scissors on colored cardstock to make simple ribbon piece cutout (as shown behind the “hello” cutout). Optional: Add Gold Dots washi tape at a diagonal for visual interest. Dab scrapbooking glue to adhere “hello” cutout to the ribbon cutout as well as to glue the cutout stars and bakers twine to the base piece and/or fabric. For the Print & Cut pieces, use a small foam dimensional sticker behind to create a dimensional look. Tug the fabric as necessary to make sure finished scrapbook design is centered. Use a running stitch to cinch the excess fabric behind the hoop. And you’re done! Now hang up your newest masterpiece so everyone can see! Just like how a museum periodically swaps in new artwork, you can do the same at home. Simply keep the embroidery hoop and drop in a new design and store the old design in a clear protective sleeve in an album. 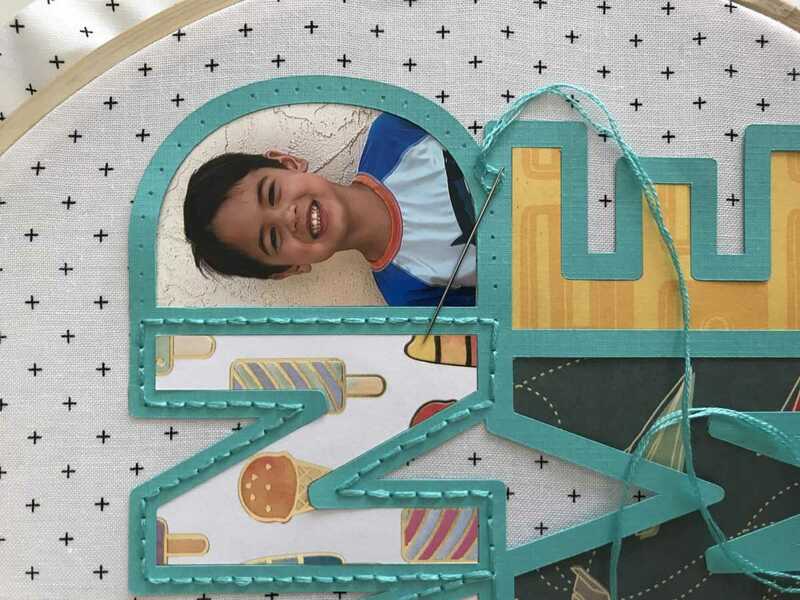 Have fun with this craft mash-up project!